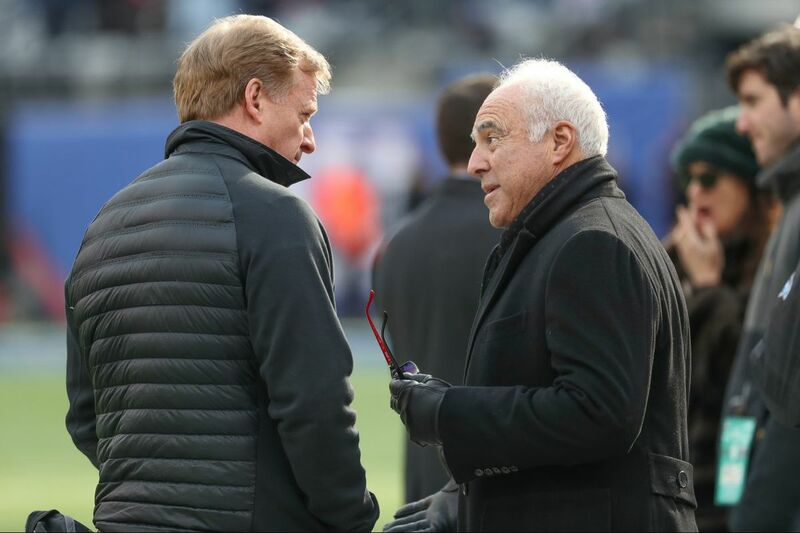 Eagles owner Jeffrey Lurie, right, shared a moment with NFL Commisioner Roger Goodell, left, on Sunday, prior to the Eagles-Giants game at Met Life Stadium. The Birds are finally flying across the pond. The Eagles will play the Jaguars in London during the 2018 regular season, NFL sources said. An official announcement was made Thursday morning and the Eagles will play on either Oct. 21 or 28 at Wembley Stadium. It shouldn't have come as a surprise. NFL UK managing director Alistair Kirkwood told ESPN back in October that he was trying to get the final six teams that hadn't yet played overseas to London next season. The Eagles were among that group. The Eagles-Jaguars meeting is one of three games scheduled for London. The Seahawks will face the Raiders on Oct. 14 at Tottenham Hotspur's on Oct. 14. The Chargers will meet the Titans at Wembley on either Oct. 21 or 28. The NFL has a deal with the Premier League's Tottenham Hotspur to hold games at their new stadium in Northumberland Park starting in 2018. The Jaguars, who have traveled to England in each of the previous five years, will be the home team. The new locale should be of great interest to Eagles fans, who annually flock to road games. The full NFL schedule will be released sometime in April. The Eagles will have home games against the Falcons, Panthers, Texans, Colts, Vikings, Cowboys, Giants and Redskins, and road games against the Saints, Buccaneers, Titans, Rams, Cowboys, Giants, Redskins and Jaguars.